Helena College is a non-faith based International Baccalaureate private K-12 school for girls and boys in the Perth Hills. Kindergarten to Year 12 across two campuses. 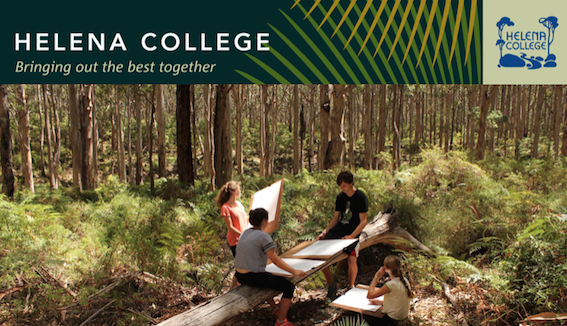 Please see College website www.helenacollege.wa.edu.au for fees brochure. I often ask prospective parents to consider, What makes Helena different? Helena is certainly an academic school, providing the right environment for the majority of our students to achieve WACE results that qualify them for entry to the university of their choice. For others, our general course study programme enables them to make strong applications for challenging TAFE courses. It is no more or less than any school should offer - so what makes Helena different? At Helena College, from Kindergarten to Year 12, we focus on developing the whole person, equipping each child with the skills and knowledge to fully embrace life after school. Academically we stretch our students through an inquiry-based approach to learning, delivered within the renowned International Baccalaureate Primary Years (K-5) and Middle Years (6-10) Programmes. We offer specialist classes right from Kindergarten, so even our youngest students stretch themselves through Physical Education, Indonesian, Performing Arts and Computing as well as core curriculum subjects. From Pre-primary to Year 12, our students stretch themselves physically and emotionally through our integrated camps programme, with age appropriate experiences to enhance resilience and personal growth as well as forging strong relationships. Relationships are the basis of school culture and must be built on a foundation of mutual respect. Respect, tolerance and empathy are the cornerstones of the value system at Helena College. At Helena College heart, mind and body align to affirm independence, self-motivation, and responsibility for self, others and the environment. I invite you to visit us and experience it for yourself. Helena College is a non-faith based private K-12 school, committed to providing a safe and nurturing learning environment for boys and girls. There are two campuses - the Darlington Campus from Kindy to Year 5 has the capacity for 210 students whilst the Glen Forrest Campus has the capacity for 640 students from Years 6-12. At Helena College we are very proud of both our bush environment and our facilities, which are in harmony with the surrounding bushland, the flora and fauna. The Darlington Campus (K-5) is set on two hectares of tranquil bush overlooking hills, valleys and, in the distance, the city of Perth. The grounds include extensive areas for nature play and sporting activities. Facilities include the Helena House Hall, library, computing room, visual arts room, pottery centre, languages room, performing arts centre and Early Childhood Centre. The Glen Forrest Campus (Years 6-12) is on an 8.3 hectare site in Bilgoman Road. The facilities include a sporting and recreation complex, a performing arts centre which provides a cultural venue for the College and the surrounding hills community. A purpose-built media centre provides the opportunity for students to develop practical skills in television, film and video production. The library is a student hub for on-line learning, research, reading and recreation. There is a purpose built Year 6 facility which opened in February 2016. The College is an International Baccalaureate (IB) school, with students in Kindy to Year 5 doing the Primary Years Programme (PYP) and students in Years 6-9 undertaking the Middle Years Programme (MYP). The IB is a framework for teaching and learning designed to meet the needs of all children. The Western Australian curriculum determines what students learn and the IB framework determines how they are taught. Students develop into independent learners with strong values and a global outlook. From Kindy to Year 5, students engage with the learning of the Western Australian Curriculum through the inquiry-based approach of the IB Primary Years Programme. The PYP develops the knowledge and attitudes, concepts and skills that children need today and into the future. In Years 6-9, students learn through the Middle Years Programme which prepares them to become active members of a global society by using critical thinking and research skills, creativity and reflection, and by participating in community service. Year 10 students have the benefit of a transition year to prepare for the assessment and reporting requirements of the Western Australian Certificate of Education (WACE). In Years 11-12, students have a broad range of subject choices for ATAR, General and VET courses. To provide innovative, educational programs of study and extra-curricular activities which empower individuals to accept challenges, extend personal boundaries and be active contributors to society. We seek to nurture individuality and self-worth in all members of our community while providing opportunities to strive for personal excellence, develop resiliency and demonstrate initiative. Helena College bus runs take students to and from Darlington, Gidgegannup, Lesmurdie, Midland and Mount Helena. There is also a free bus each day that travels from the Glen Forrest Campus to the Darlington Campus in the morning, and then does the reverse journey in the afternoon. Bus routes are reviewed at the beginning of each year to best accommodate student needs. Wherever possible buses will stop at a location that is most convenient for the student. For more information about the bus services, click here. The College alumni - Old Helenians - is coordinated by Sue Wallace, Alumni and Community Relations Officer. Reunions and Old Helenians events are held regularly with a 1 year and 10 year reunion. Check out the Old Helenians Facebook page or email for further information. There’s no doubt our unique environment also makes Helena special. The natural bush setting enhances learning at our Darlington Campus for Kindergarten to Year 5 students, and at our Glen Forrest Campus, home to the Middle School (Years 6-9) and Upper School (Years 10-12). At Helena College heart, mind and body align to affirm independence, self-motivation, and responsibility for self, others and the environment. I invite you to visit us and experience it for yourself. I look forward to welcoming you into the Helena family. You are most welcome to tour our College. Each campus holds two tours each term for prospective parents. The Darlington Campus (K-5) tours commence at 11am on Thursdays, followed by a morning tea with the Head of Junior School. The Glen Forrest Campus (6-12) tours commence at 9.30am on Tuesdays, followed by morning tea with the Principal and other members of the College executive team. Please contact the Registrar to book in for a tour 9298 9100 or visit the Tour & Event Bookings page on our website.